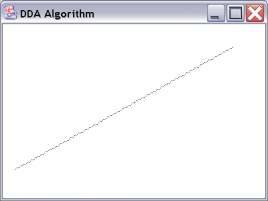 Scale the normalized value by the width or height of the drawing area. 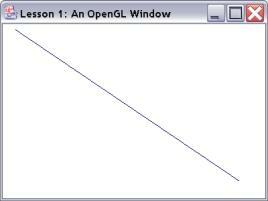 gl.glClear (GL.GL_COLOR_BUFFER_BIT); // Set display window to color. gl.glColor3f (0.0f, 0.0f, 0.75f); // Set line segment color to blue. gl.glVertex2i (180, 15); // Specify line-segment geometry. o Assume a line with positive slope in the first octant, i.e., 0.0 <= m <= 1.0.
o Problem: as xi is incremented to xi+1, which pixel gets turned on - xi+1, yi or xi+1, yi+1? § e.g. 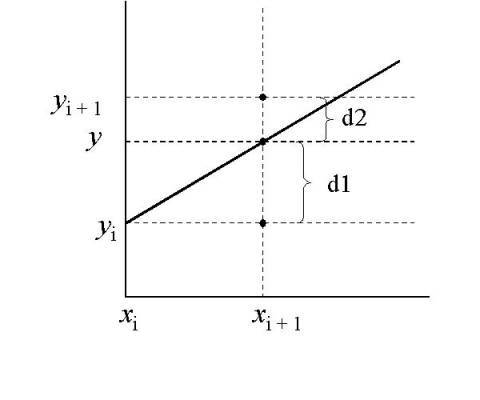 if Dx = 10 and Dy = 5, then take unit steps along x and compute steps along y. § Assume a line of positive slope from x1, y1 to x2, y2. // Set line segment color to blue. 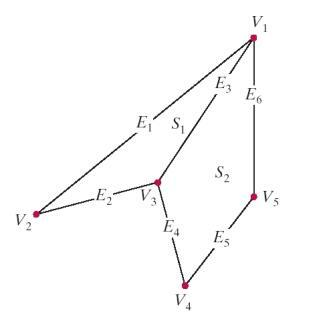 § Determine d1 and d2 -> the "error", i.e., the difference from the " true line." § now define pi = dx(d1 - d2) = relative error of the two pixels. ( = 0 is our choice). § Therefore we only need to know the sign of pi . · Now look at the relation of p's for successive x terms. Enter endpoints (x1, y1) and (x2, y2). Compute dx = x2 - x1 ; dy = y2 - y1 ; p1 = 2dy - dx. Repeat steps 4, 5 until reach (x2, y2). Note: Only integer Addition and Multiplication by 2. Notice we always increment x by 1. 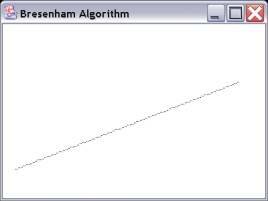 For a generalized Bresenham Algorithm must look at behavior in different octants. Closed polyline where initial and terminal points coincide. · A point P(u) on a curve depends on a parameter u.
o Unit circle varying u in increments of 0.05 from 0 to 1. · Bézier curve is a polynomial curve the shape of which is determined by the placement of a series of control points. 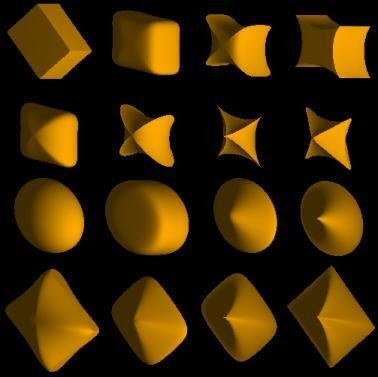 · Figure displays a series of Bézier curves with four control points. · Jn,i are the basis or blending functions which assure the curve travels smoothly from B0 to B3 . · Four vertices define a cubic equation with four blending functions. · x(u) and y(u) are calculated by substituting in the x and y coordinates of B0 through B3, respectively. · Values for u are selected in a uniform way. 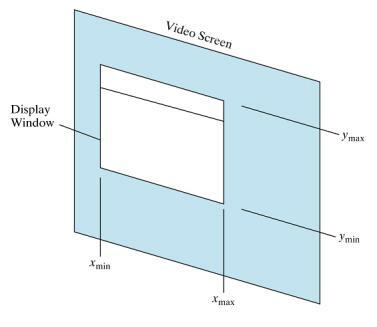 · Assume the simplest case, i.e., an 8-bit, non-interlaced graphics system. · Then each byte in the frame buffer corresponds to a pixel in the output display. o Number of rows = number of raster lines. o Number of columns = number of pixels/raster line. 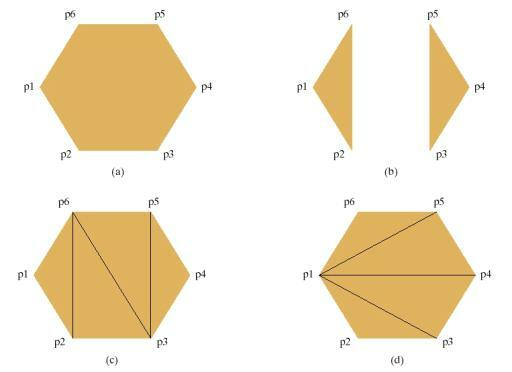 A plane figure specified by a set of three or more coordinate positions, called vertices, that are connected in sequence by straight-line segments called the edges or sides of the polygon. 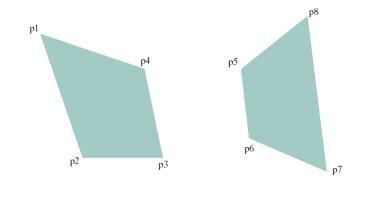 In basic geometry, the polygon edges must have no common point other than their endpoints. A polygon must have all its vertices within a single plane and there can be no edge crossings. Convex polygon – all interior angles of a polygon are less than or equal to 180 degrees. 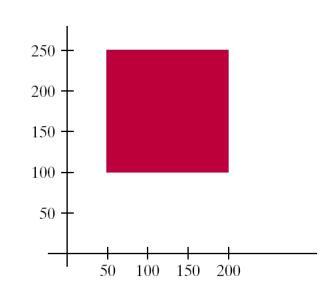 at least one interior angles of a polygon is greater than 180 degrees. 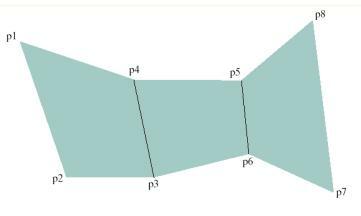 Use the cross product of adjacent edges to test for concavity. All vector products will be of the same sign (positive or negative) for a convex polygon. o If z – value of some cross products is positive while others are negative, concave polygon exits.